Everywhere you look, Teahouses are popping up around the country. A teahouse is an establishment that serves tea and light refreshments. It appears to me, that soon teahouses will become as popular as coffee houses. “Tea” is served many ways, varying between cultures. In Asia, teahouses are a popular place to meet, socialize and enjoy small plates of food. Tea was first introduced as a medicinal herb between 200 – 850 C.E. It evolved to help Buddhist Monks stay awake during their meditation, caffeine being the key ingredient. During the 8th and 9th centuries, teahouses were common in Asia serving as a social gathering place. Tea drinking has been a favorite pastime of the British for centuries. I associate tea drinking closely with the English, maybe because my parents are European and we often had afternoon tea when I was growing up. In the UK today, a tea room is a small room or restaurant where beverages and light meals are served. The food can range from a cream tea (also known as Devonshire tea) with a scone and jam, to an elaborate afternoon tea featuring tea sandwiches and small cakes, to a high tea (like a meal). Part of the charm of the occasion is the attractive decorated china tea set. 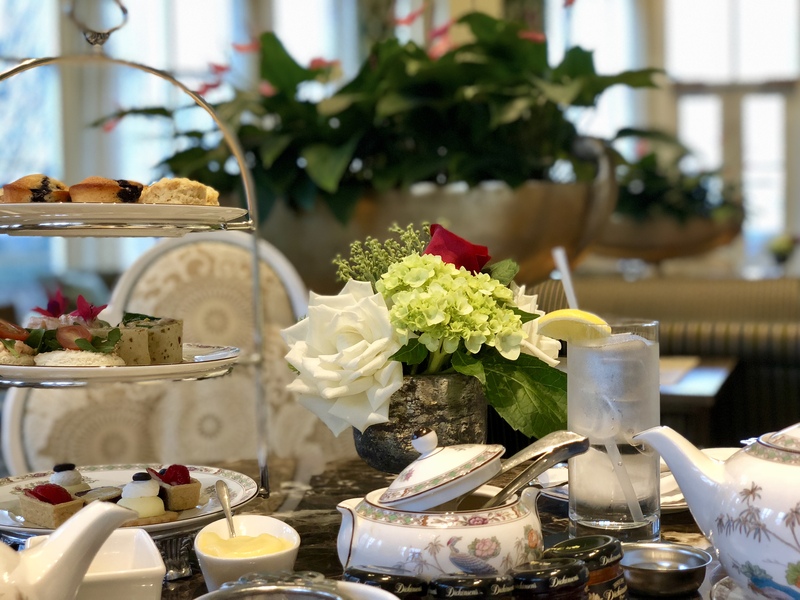 On a recent family trip, my husband and I had the pleasure of enjoying a traditional English tea experience at the Nemacolin Woodland Resort. Afternoon Tea at Nemacolin Resort is served in the Tea Lounge. The Tea Lounge is located in the Chateau Lafayette. The room has a great ambiance, elegant but still warm. We had tea on a Sunday afternoon, so it wasn’t crowded. Reservations are required for the event, and the table is preset before you arrive. Each table has a beautiful floral arrangement. Our table had a combination of hydrangeas and roses. Our table was set with a beautiful menu and tea box with 12 imported teas to select from, each having a wonderful aroma. The tea selection included black, oolong, green, white, and herbal. The table was also elegantly appointed with a lovely china tea set. This experience got me thinking about buying a tea set, I love this vintage blue rose porcelain set HERE. Each teacup has a strainer to filter the tea leaves. The selection of teas was really amazing. I chose the Lavender Earl Grey scented with oil of bergamot and perfumed with lavender buds. This tea is soothing and uplifting. My husband chose the Darjeeling Oolong, an epicurean blend of Indian champagne Darjeeling, and floral China Oolong. We were presented with an assortment of scones, muffins, breads, tea sandwiches, and pastries. Whipped butter, lemon butter, honey, jams, cream, and sugar also accompanied the tea service. The setting was beautiful, and we thoroughly enjoyed our English teatime in the Chateau. The tea was so delicious, I drank an entire pot! We will definitely be visiting more Teahouses in the future. Sign up to receive more Happy Haute Home posts delivered right to your inbox by subscribing. Feel free to Pin these pictures and follow along on Pintrest HERE, and Twitter HERE . If you’re looking for daily decor inspiration, follow along on Instagram HERE. I really like Tea Houses when I want to be bit ‘posh’. So striking how different a Tea House is compared to a coffee shop, which is so much more casual. The above pictures looks lovely and I’m sure you guys had a great time! You’re so right, there is definitely a different level of formality…personally I prefer teahouses 🙂 Thanks for visiting Lelanie! That china pattern is called Kutani Crane, it is my pattern and Wedgewood doesn’t make it anymore, although you can find it on replacements.com. I visited that lovely resort about 14 years ago for an equestrian competition, we didn’t stay long enough, quite beautiful. The pattern is beautiful, you must enjoy using it! The resort is lovely, we visit often..and there is so much to do being 2000 acres! Thanks for visiting my site! Lovely pics and post as usual. You have such a gorgeous blog I nominated you for a Sunshine Blogger award to share it. Don’t feel you have to pay it forward if that isn’t your thing, just spreading the loveliness! I love afternoon tea as well! But yes, maybe we should skip the cream and the pastries. Thanks for stopping in Lynn! Wow, that is gorgeous. I love the decor, just my style. The AT looks fantastic. very good post thank you for sharing. keep it up good.